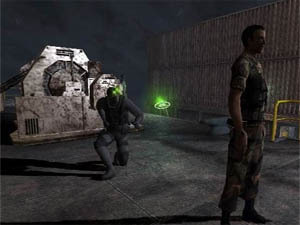 The latest Splinter Cell game has finally arrived on the PlayStation 2 and once again lets gamers play the role of Sam Fisher, a 50 year old NAS operative for the United States government. Don't let his age scare you because Fisher is still the best damn operatives the U.S. government has got and once again they call upon his prowess to save the free world of an apocalyptic disaster that is about to happen in Asia. 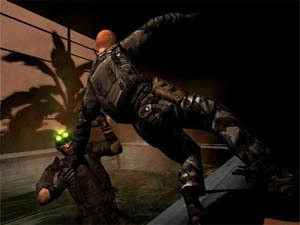 Even though the Splinter Cell series is "slightly" superior on the XBox, the PlayStation 2 version should not be scoffed because it features the same exciting storyline and gameplay that has made the XBox version so popular. However with that said, there are a few missing features on the PlayStation 2 version (such as some graphical effects and online options) but you don't need to rush out and buy an XBox console because the missing segments are minimal and fortunately doesn't affect the main gameplay option. 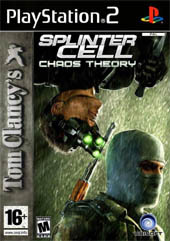 Tom Clancy's Splinter Cell: Chaos Theory (now known in this review as Chaos Theory) is made up of three different gameplay modes that include Single-Player Campaign, Co-op missions and a four person online and LAN multiplayer mode. The basic mechanics behind the single-player mode has not changed at all from its predecessors as the game still requires you to use as much stealth as possible as you travel through extremely dark locales to complete your mission. Most of the time you'll be sitting in the shadows and waiting for an opportune time to attack. When it is obvious that there are two or more guards in the vicinity, then you'll probably be waiting even more, because simply running into combat without a plan will reward you with the "mission failed" screen. The good news is that this time around, the game is more forgiving to impatient and careless behavior this time around, so if you want to shoot most of your foes instead of sneaking up on them, go right ahead because it will only make things more difficult for you, but it's possible. In fact, before each level, you can choose equipment more geared towards assault tactics instead of stealth. You still have to pay attention to cameras, wall mines, and such. As veterans of the series already know, executing Fisher's basic moves requires very little effort. Jumping, crouching, drawing/holstering your weapon, picking up bodies, grabbing enemies from behind and more are all accomplished by pressing one button. Latching onto ladders and poles is easy too -- just walk up to it and Fisher will automatically grab on. Naturally, Chaos Theory also offers some new moves. First off, Sam now uses a knife in some of his close combat moves. When you grab a character, he will now hold the knife up to the person's throat. Once a character is in your clutches, you can press R1 for a quick lethal attack or L1 for a non-lethal choke attack that makes the person pass out. If you actually want to slit an enemies' throat, you have to sneak up on them and press R1 without grabbing them. Graphically, Splinter Cell Chaos Theory is better looking than the average PlayStation 2 game but the game can look bland at times. Don't get me wrong, the lighting is great as always and Fisher's animations are usually top-notch but some levels are simply too dark, dull and claustrophobic which unfortunately shows the limitations of the aging PlayStation 2 console. To be fair though, this game was optimized for the XBox and PC and to be successfully ported onto the PlayStation 2 is a feat in its own. The audio and musical score of Chaos Theory is easily one of the "better" games around at the moment and features the voice acting of Michael Ironside for that real Hollywood movie feel. Match that with a plethora of realistic sound effects and a soundtrack that is fit for any big block buster action movie and you have one awesome sounding game. In conclusion, Tom Clancy's Splinter Cell: Chaos Theory is a worthy sequel to Ubisoft's popular franchise. With an awesome storyline, a beautiful and well designed game engine, Chaos Theory is easily worth the purchase that I would recommend to all gamers who want something more than just action on their gaming diets. Check it out!